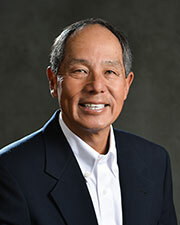 Ron Sagara was born and raised in Hawaii, on the island of Oahu. As a youngster, he took advantage of the great weather and spent weekends and summers outdoors surfing and playing all sports including golf. When not surfing, Ron would often play with his dad at popular golf course a few blocks from the beach. Ron Sr. never received any formal training, but was an avid golfer in his own right. He recently retired after working for more than a decade at the Stanford Golf Course. Ron relocated to the Bay Area in the early-1980's and has been with Mariners Point Practice Center since 1996. Prior to becoming a PGA Golf Professional, Ron enjoyed a successful corporate career at Levi Strauss & Co. where he created national print and media advertising campaigns for the jeans apparel company. During the first decade of the new century Tiger Woods almost single-handedly made the sport of golf popular. The "Tiger Effect" lead Ron to pursue a new career as a Golf Professional. He enrolled in the PGA of America Golf Management Program in Port St. Lucie, Florida, where he was privileged to spend four years of academic training with some of the brightest minds in the golf industry. Upon graduating he was elected into membership by the PGA of America as a PGA Golf Professional. Teaching and coaching are two of the most valued skills that PGA Professionals offer in an area where they can make a real difference. Ron's teaching philosophy is suited for all skill levels – whether that's a beginning golfer experiencing the excitement of hitting a ball in the air for the first time, or a committed player learning a swing change that saves a stroke and lowers their score. His methods are based on proven models of learning, using simple and repeatable swing progressions, incorporating verbal, kinesthetic, and visual cues. His building-block approach to learning enables his students to successfully attain short-term goals. He does not provide "quick fixes", but rather prescribes a practice regiment that when imprinted over time, on a regular basis, produces new desired habits. Ron believes that there are no short cut solutions to long-term situations. Ron believes in trying to find the right balance in life between work and his personal life. Time spent outside of teaching enables him to be mentally and physically refreshed for his students. To maintain that balance, Ron and his wife enjoy a physically active outdoor lifestyle in Laguna Niguel, California, which includes working out, swimming or just enjoying the beach. PGA Class A Golf Professional, U.S. Kids Golf Certified Instructor and a Positive Coaching Alliance Certified Double Goal Coach. His students have qualified for the Callaway Junior World Championships in San Diego, CA, and the U.S. Kids Golf World Championship at Pinehurst, N.C.